AccessoryGeeks.com | Universal Premium HD Head Up Display (HUD) Reflective Film | FREE SHIPPING! Universal Premium HD Head Up Display (HUD) Reflective Film Attach this screen to your windshield so you can see navigation projections from your Head-Up Display (HUD) reflected on your glass. Plus your eyes stay safely on the road. RED SHIELD Universal Head Up Display HUD Reflective Windshield Film 7.5" for All Car Makes and Models. Premium Quality High Definition (HD) Clarity Film. Compatible with All HUD Units and Smartphones. High Definition crystal clear clarity film provides the best display resolution and pixels per inch (ppi) to best reflect the projection of speedometer, tachometer, or navigation from your HUD unit or your smartphone. This HUD film will work well anytime throughout the day, whether that be day or night. 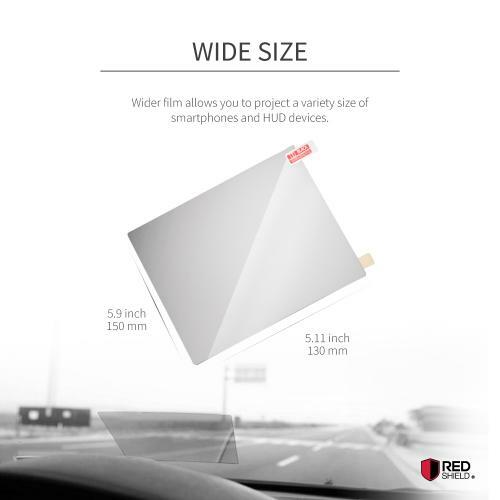 Reflective HUD film has universal compatibility and will work with all Head-Up Display devices and smartphones with HUD compatible apps. It will work with all cars, trucks, vans, buses, RVs, motorcycles, boats, etc. Safety is always important! 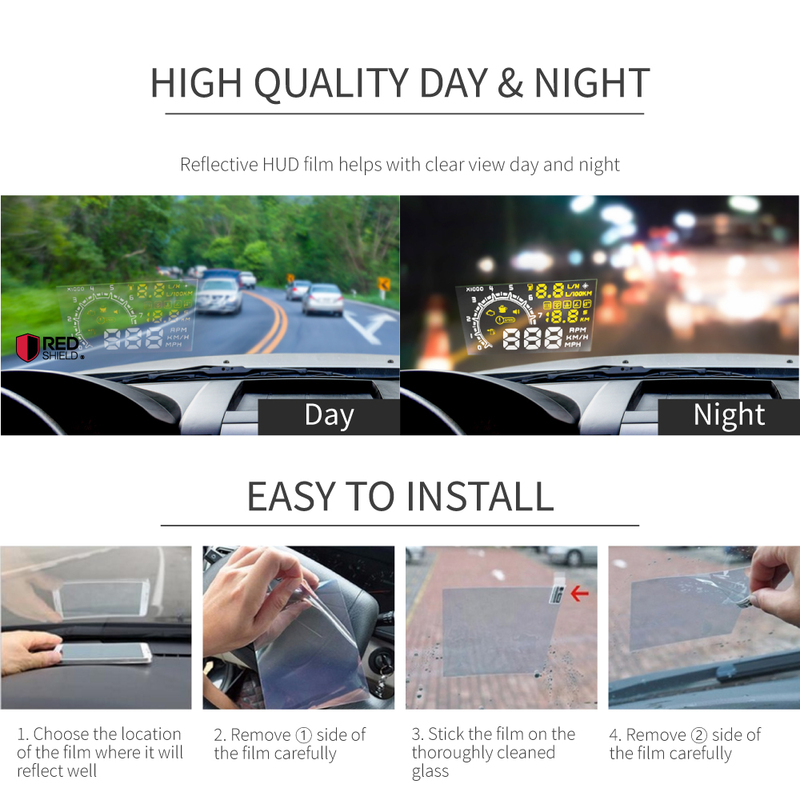 HUD film is transparent so it will not distract you from driving. Place the HUD film where you think it will be most safe. Common installation places are driver’s side or center of the vehicle. This HUD film will offer great driving experience while keeping your eyes on the road. 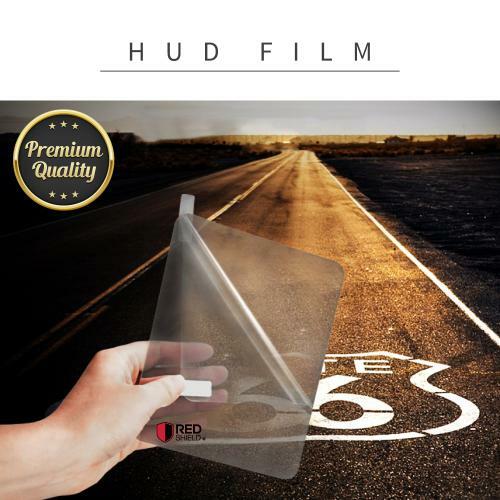 Easy to install HUD reflective film will only take 5 minutes of your time. Please be sure to clean your windshield thoroughly before installation to ensure maximum adhesion. The film is also easy to remove and leaves no adhesive residue. Please use heat gun or hair dryer to heat up the film for a better and easier removal process. The dimension of this film is 5.9 x 5.1 inches and 0.1 inch in thickness. 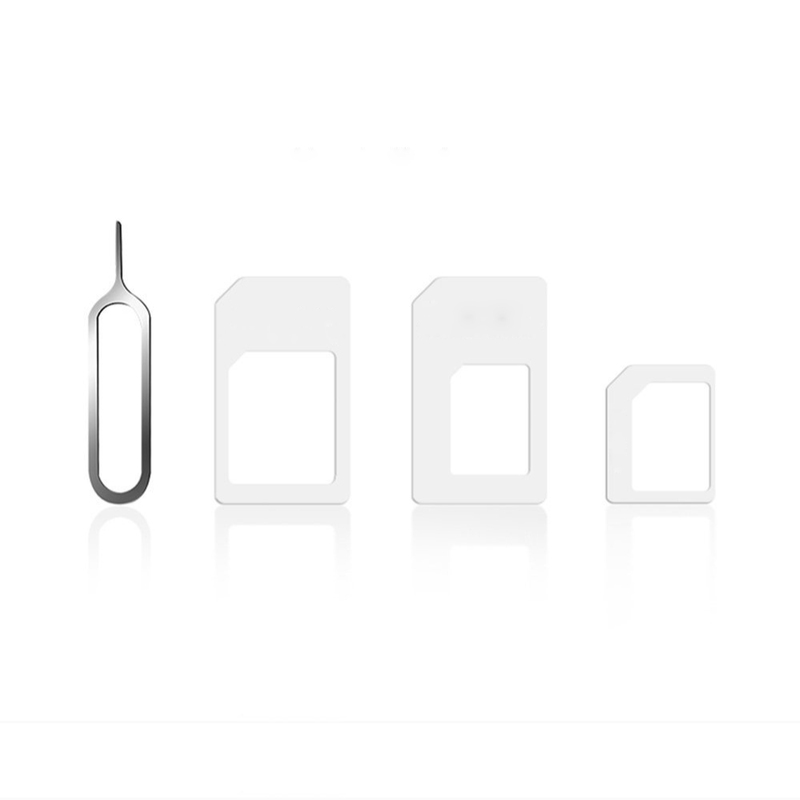 It can support display sizes of up to 7.5 inches to help with maximum screen coverage. 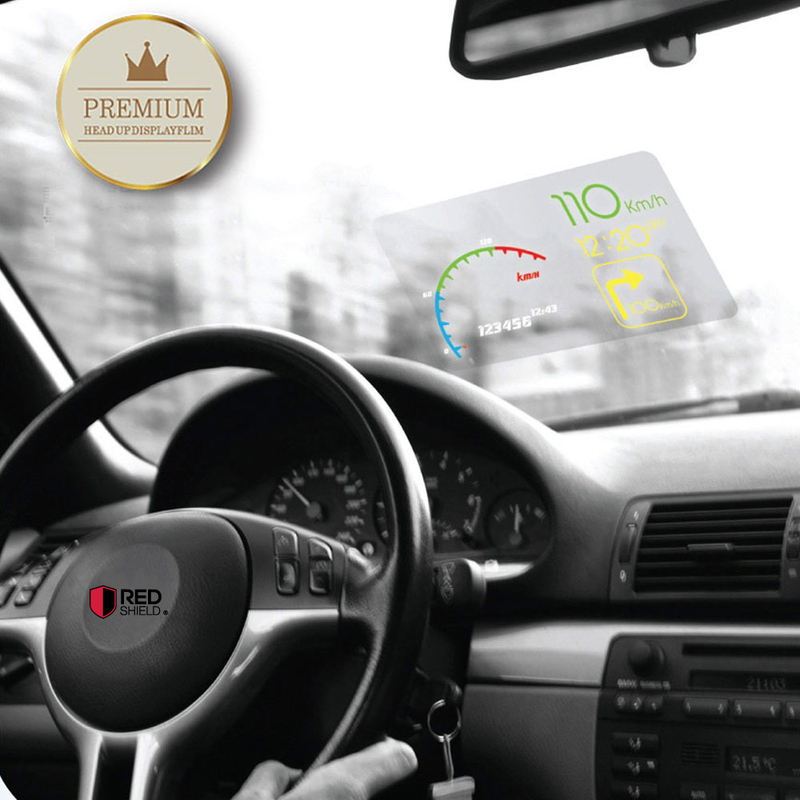 It helps you see the numbers and information clearly on your windshield even in broad daylight. 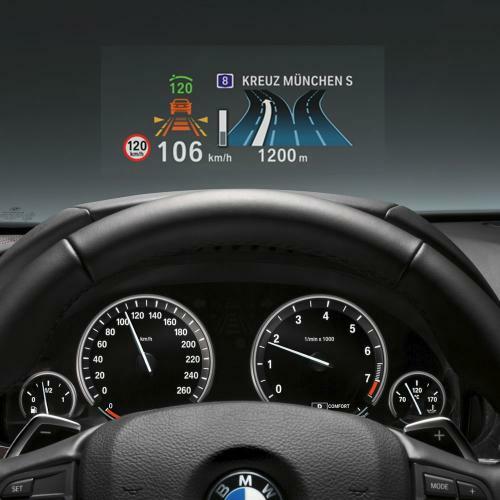 Attach this screen to your windshield so you can see navigation projections from your Head-Up Display (HUD) reflected on your glass. Plus your eyes stay safely on the road. Attach this HUD film to your windshield so you can see navigation, speedometer, or tachometer projections from your Head-Up Display (HUD) reflected on your glass. Plus, you can still drive safely while keeping your eyes on the road. 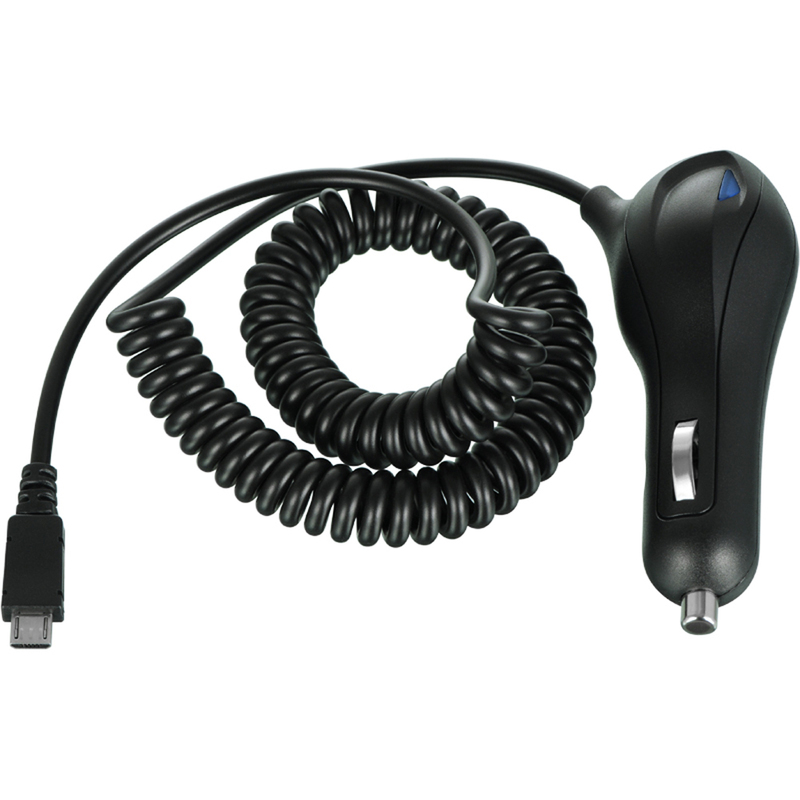 It is compatible with any car, HUD, and smartphone. Premium crystal clear HUD film is a High Definition clarity film that ensures maximum display resolution for your HUD or phone's display. See the numbers clearly reflected on your windscreen even in broad daylight. 7.5” film provides maximum screen coverage and size. 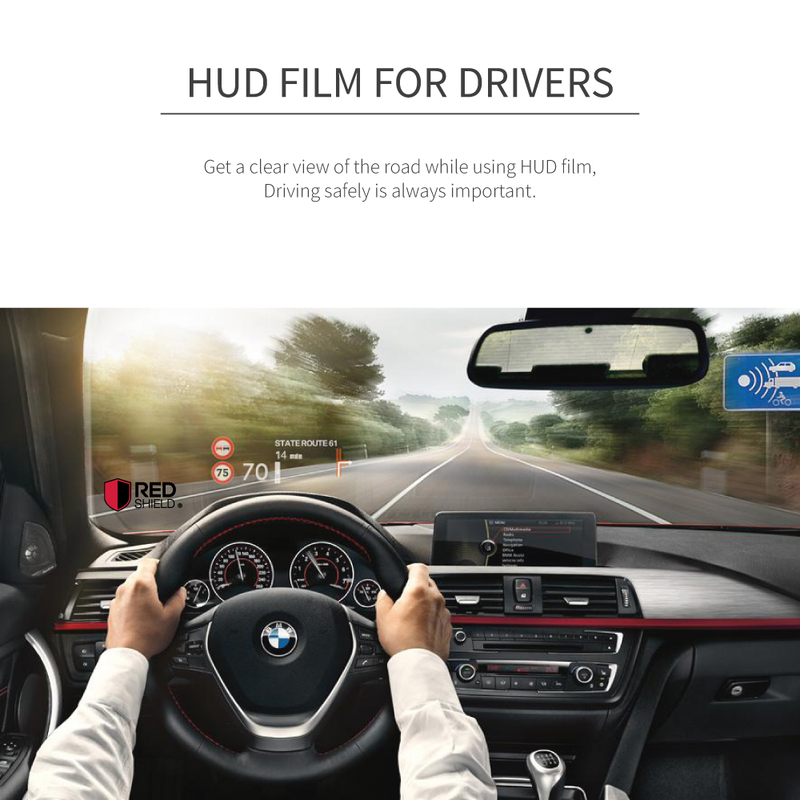 Make your driving experience more fun while being safe on the road with this HUD film. 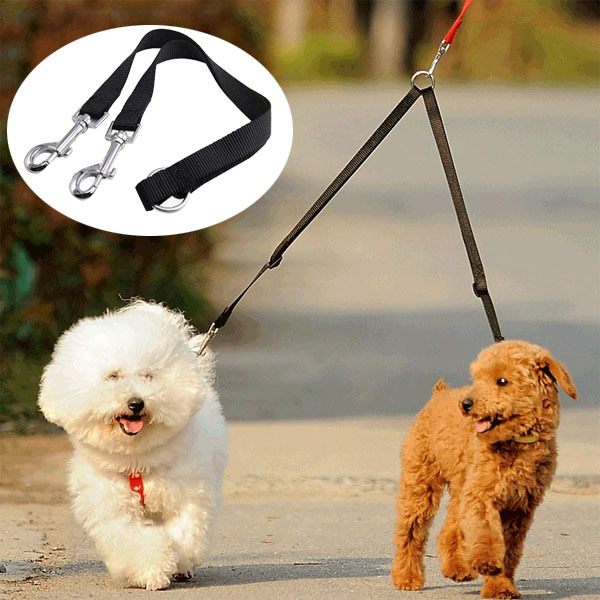 Universal Adjustable Pet Car Seat Belt [Black] Keep Your Dog Safely Restrained While Driving! Work great! Easy to install, easy to adjust to match speedometer and very easy to read day or night. Now my husband can see what speed he is driving! Nice and simple way to get HUD in my car. The unit accurately shows the speed, mileage, trip distance and other information. Quality is very good and looks great at night with colorful digits and graphics. Great film!Easy to install and provides great ability to see my HUD! It adds a touch of really helpful tech to my car as I tend to never wath the speedometer and gets me in trouble. Awesome! Easy to set up and gives my car a stylish upgrade. I can see the HUD in all but the brightest light and have no bubbles. It looks cool at night! Super easy installation and it looks great and the unit accurately shows the speed. The quality is very good, looks great at night with colorful digits and graphic. So far so good. It's good for night time driving, so bright and clear. It's very simple displaying just speed and compass. The reflection film makes it more clear on the windshield. Fantastic! Very nice HUD! Really love this because it saves me from looking down so I can keep my eyes on the road at all time! It connected to my devices without trouble and comfortable to wear! I love the design to show the speed on it, so I do not drive too fast! It's clearly visible from reflecting of the dash and is very accurate. Great product for the price! So good so far. It's good for night driving. Bright and clear. I have been using it for almost a year. It's very simple, displaying just speed and the reflection film make it more clear on the windshield. It's visible during the day and it's good for night time bright and clear. Very simple displaying just enough speed and compass. The reflection film makes it more clear on the windshield. Awesome! Coolest gadget out there to monitor speed and many other features. It's good for night time driving, bright, and clear. The reflection film makes it more clear on the windshield. Thanks, Geeks! 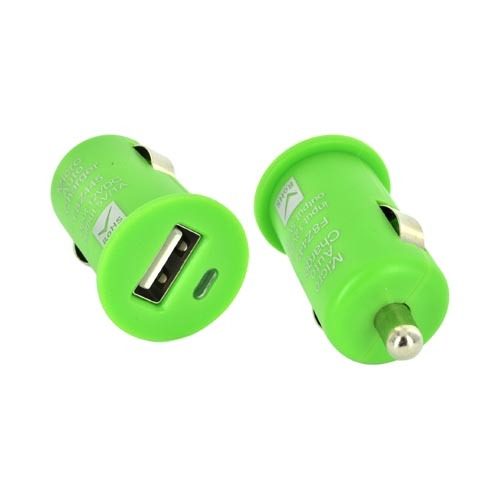 Good solid build quality and easy to set up and gives my car a stylish upgrade. I find it very useful seeing that I don't have to look down to take an eye from clear view. Works very well and is very accurate. Provides great ability to see my Head Up Display. It will be safer for me to drive on freeway. Many thanks! Worked exactly as specified. This is great film, easy to install and provides a great ability to see my HUD! Highly recommended. 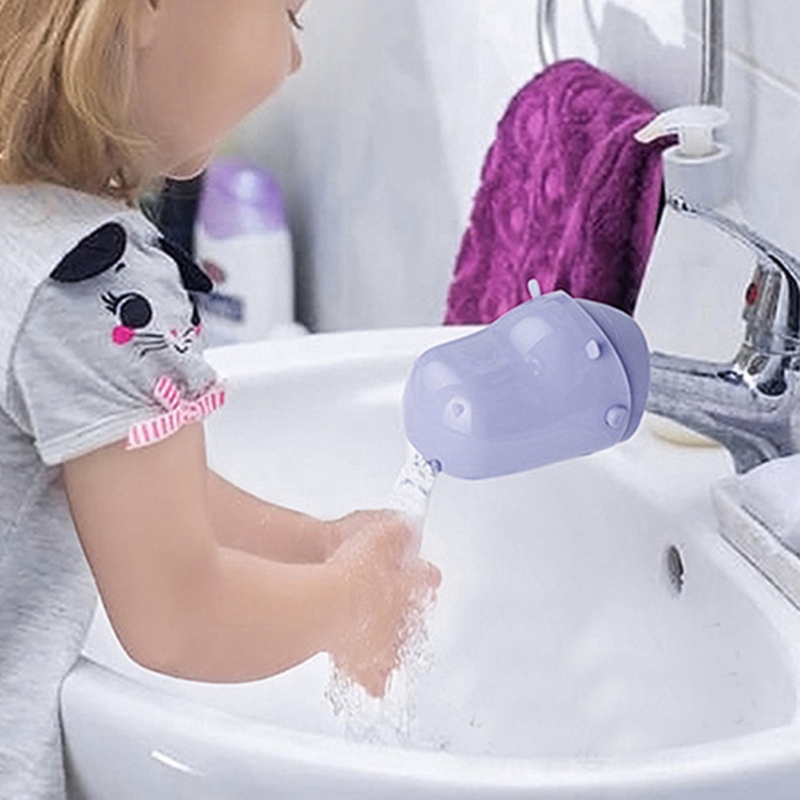 I've been using it for almost a year now, it's a fantastic product. It's very simple, displaying just speed, engine temp or the current. The brightness is really good. Exactly what I was looking for. I really love this because it saves me from looking down so I can keep my eyes on the road. Convenient and easy to use. Great film it was easy to install and provides great ability to see my HUD! Gives my car a stylish upgrade. Highly recommended. Easy to install, good quality and the car dashboard information are clearly can be seen. I don't have to look down to read speed. It's safer now! It's a simple display but comes with enough options. Allows you to keep your eyes on the road at all times. Exactly what I wanted. Awesome! Easy to set up and gives my car a stylish upgrade and it provides great ability to see my HUD! Easy to install. This is the coolest thing I have bought for my daily driving. It's very easy to program and has probably saved a dozen times already from speed cameras. Never have to look down at speedometer again! Perfect for what I needed for. I really love this because it saves me from looking down so I can keep my eyes on the road. Great price! 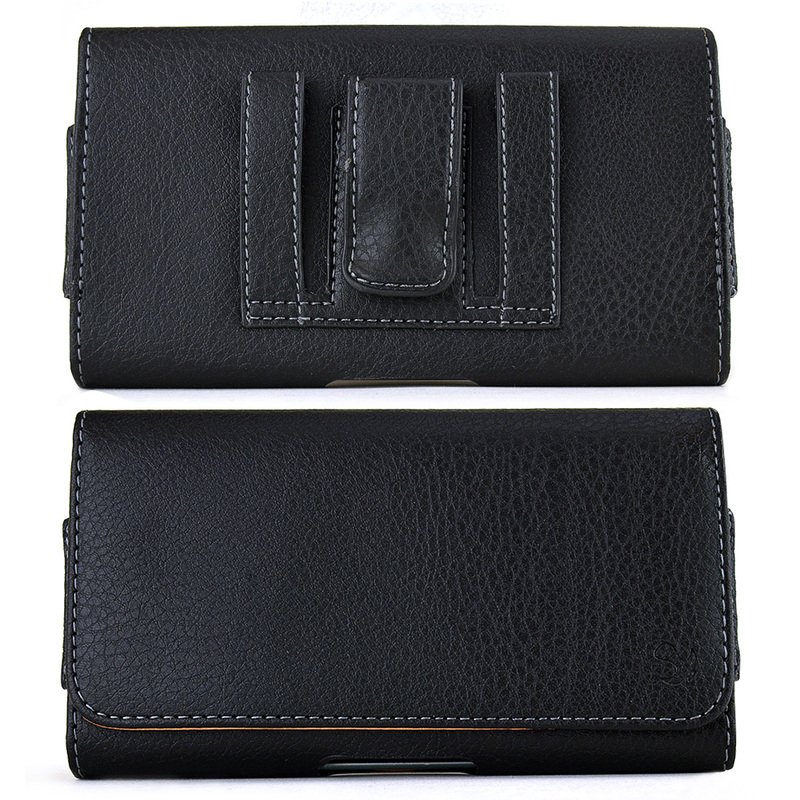 Excellent quality it works perfectly! It provides great ability to see my Head Up Display. Great film, just what I expected. Easy to set up and gives my car a stylish upgrade and provides great ability to see my HUD! Awesome! Awesome! Easy to set up and gives my car as a stylish upgrade. Just works well at night! With reasonable price!.Highly recommended. It was pretty easy to install on my car. Works great, good price and fast delivery. I am smart driver! Easy to install, very useful and I am more than pleased with the results of this Head Up Display. This is premium quality made product. Price is great! 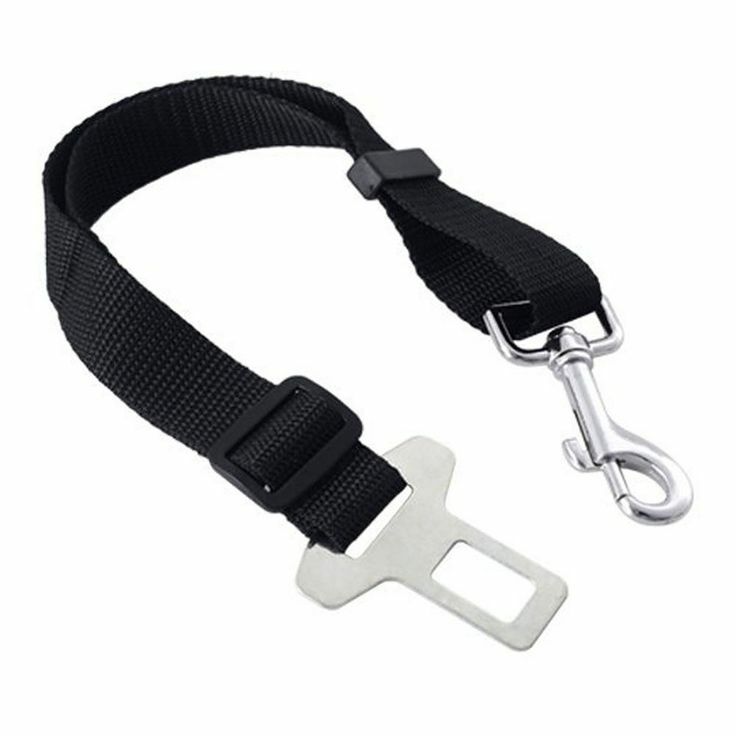 It works great very useful and it saves me from looking down so I can keep my eyes on the road. Easy Installation and highly recommended. I'm glad to have this! I really love this reflective film because it saves me from looking down so I can keep my eyes on the road. Works Great at night! I purchased a couple of these to go along with my Encore Universal A8 Heads Up Display. Although they are a little small for this particular device, they still work nicely as you can get the entire device to show if you have it set up just right. The best thing about these are that they can be removed and put back on over and over again, whereas the original piece of tint that came with the HUD could not. I would definitely recommend these for any type of HUD device that reflects on a windshield. Perfect for my hud. The one that came with it wasn't big enough ( or you had to get it just perfect). I will be buying another one for a spare. You're reviewing: RED SHIELD Universal Head Up Display HUD Reflective Windshield Film 7.5" for All Car Makes and Models. Premium Quality High Definition (HD) Clarity Film. Compatible with All HUD Units and Smartphones.